The Amgen Biotech Experience curriculum includes a series of cloning and protein purification experiments using red fluorescent protein (RFP). Fluorescent proteins have become a valuable tool in recent years among scientists in many different fields of biology. 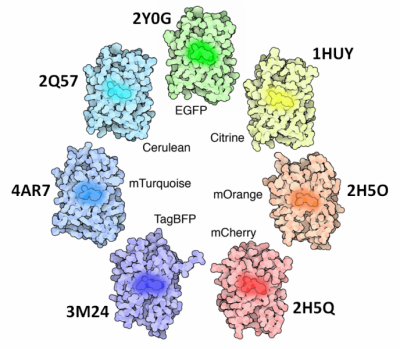 Often, these glowing proteins are linked to other proteins of interest to confirm protein expression, to identify where specific proteins exist in the cell, and to track cell movement. 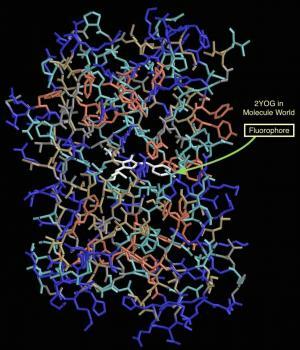 Green fluorescent protein (GFP) is perhaps the most well-known fluorescent protein. Isolated from the jellyfish Aequorea victoria, GFP is comprised of 238 amino acids that form 11 beta-sheets that roll in to a "beta-can," as seen in the image of GFP (right) from the European Bioinformatics Institute. Coloring by hydrophobicity shows that hydrophobic residues (brown) are located in the interior of the protein with hydrophilic residues (blue) on the outside. The white residue in the center is the fluorophore. To obtain the Answer Key and Grading rubric and a PowerPoint of the Key for In-Class viewing, request an Educator account, then you'll be able to log in and access answer keys. Image by David S. Goodsell, RCSB Protein Data Bank (www.rcsb.org) of PDB IDs 3m24, 2q57, 4ar7, 2y0g, 1huy , 2h5o, 2h5q. For more information about GFP-like fluorescent proteins, visit the "GFP-like Proteins" page by Dr. Goodsell at the Research Collaboratory for Structural Bioinformatics (RCSB)'s PDB 101. For more information about fluorescent proteins, including their discovery, molecular characterization, and use, visit "Fluorescent proteins" at Scholarpedia. PDB ID 2y0g: A. Royant & M. Noirclerc-Savoye (2011) Stabilizing role of glutamic acid 222 in the structure of enhanced green fluorescent protein. Journal of Structural Biology 174, 385-390. PDB ID 2q57: G. D. Malo, L. J. Pouwels, M. Wang, A. Weichsel, W. R. Montfort, M. A. Rizzo, D. W. Piston & R. M. Wachter (2007) X-ray structure of Cerulean GFP: a tryptophan- based chromophore useful for fluorescence lifetime imaging. Biochemistry 46, 9865- 9873. PDB ID 2h5o, 2h5q: X. Shu, N. C. Shaner, C. A. Yarbrough, R. Y. Tsien & S. J. Remington (2006) Novel chromophores and buried charges control color in mFruits. 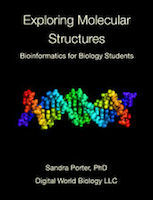 Biochemistry 45, 9639-9647. PDB ID 1huy: O. Griesbeck, G. S. Baird, R E., Campbell, D. A. Zacharias & R. Y. Tsien (2001) Reducing the environmental sensitivity of yellow fluorescent protein. Journal of Biological Chemistry 276, 29188-29194. 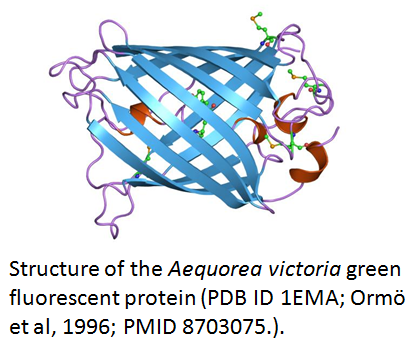 PDB ID 4ar7: D. Von Stetten, M. Noirclerc-Savoye, J. Goedhart, T. W. J. J. Gadella & A. Royant (2012) Structure of a fluorescent protein from Aequorea victoria bearing the obligate- monomer mutation A206K. Acta Crystallographical Section F 68, 878.